When you get braces through Milestone Orthodontics in Paramus, NJ what you can and can’t eat will become something to think about. Foods like nuts and hard candy can damage/break your braces, while biting into hard foods can pull away the brackets and wires, all of which could be painful and prolong treatment. Dr. Matthew Milestone also stresses that patients avoid foods that are chewy, crunchy, sticky or gooey! So what are foods you can eat with braces? When you first get your braces, sticking to a diet of very soft foods that require little chewing is suggested. Ice cream may be the first thing that comes to mind, and if you’re going to eat ice cream Dr. 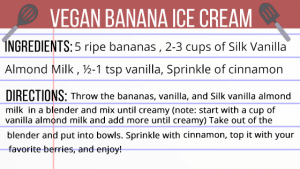 Milestone recommends this delicious, braces-friendly, vegan banana ice cream sundae recipe! A vegan banana ice cream sundae is a healthy alternative to sugary ice cream. Moreover, when you get braces through Milestone Orthodontics in Paramus, NJ, your teeth will be more susceptible to cavities; another reason why a healthy, nutritious diet is important. And there’s healthy alternatives to all your favorite guilty food pleasures just like this ice cream recipe. If you have any questions about foods to avoid with braces, be sure to contact us! Are you ready to begin your journey to a beautiful, natural smile? Click HERE to schedule a FREE CONSULTATION with Milestone Orthodontics!